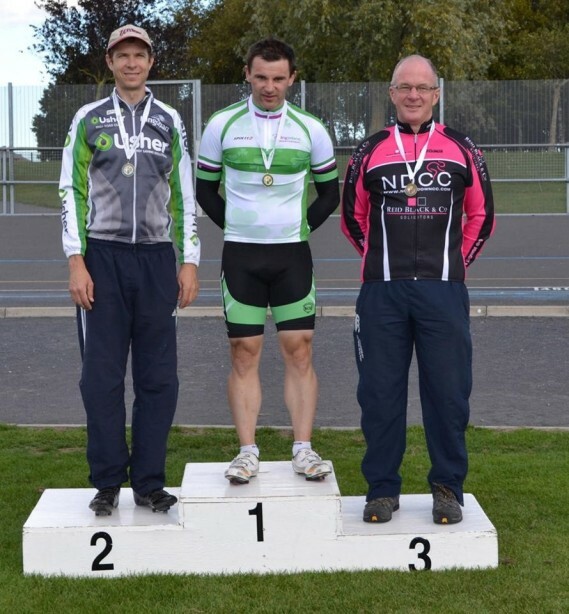 Iverk Produce Carrick Wheelers strongman Hugh Mulhearne continued his impressive run of track form last weekend, winning the National Veterans Individual Pursuit and 500m TT Championships. The championships, which were held at the Sundrive Velodrome in Dublin, attracted the top veteran riders from the island of Ireland and Mulhearne was billed among the favourites to win a title, given his track successes in 2012. The first of the events to be decided was the 3km Individual Pursuit. This event involved each participant riding a qualifying round in order to decide who will make it into the head-to-head finals for the medals. Mulhearne, a Kilmacthomas native, blitzed around the track in qualifying, to set an imposing time of 3mins 48secs and land himself a place in the final, where he would be in a ride-off to decide the gold and silver medals. Greg Swinand of the Dublin based Irish Road Club was Mulheanre’s opponent in the fight for the title of National Veteran Pursuit Champion, and having qualified with a time of just 3secs slower than Mulhearne’s, the Carrick Wheelers man knew he would have a serious battle on his hands to land the championship. In the finale, Mulhearne, to the amazement of the crowd went even faster than he did earlier that day in qualifying, posting a time of 3mins 45secs, enough to secure victory over Swinand, claiming another fantastic national title and gold medal for his ever expanding collection. 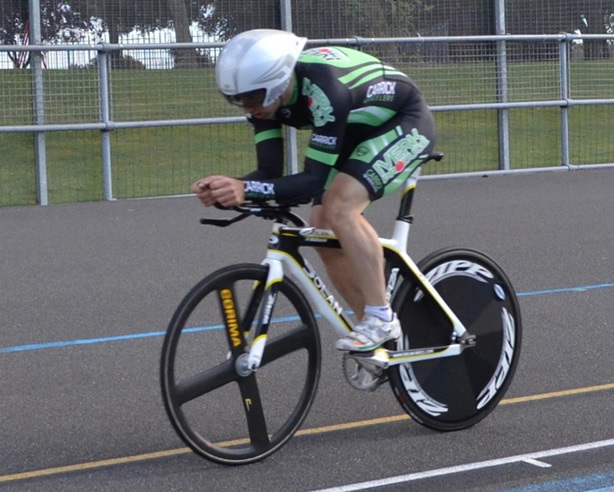 The next event of the National Veteran Track Championships was the 500m Time Trial. This event involves a one off standing start 500m time trial, and with no qualifying rounds or second chances, this contest really had a winner-takes-all feel to it. The well-known Carrick Wheelers man was not too confident about his chances in this event, given that his personal best for this event was almost 39secs, with times in the region of the low 38secs or below usually deciding the medals. Nonetheless, Mulhearne’s form was good, and he gave it his all to speed around the track in a scorching time of 37.62 secs, a new PB which was good enough for 1st place, landing the Co. Waterford man another national title. The final event up for grabs on the track was the 20km Scratch Race. This track event differs to most of the others in so far as it is a mass start event, as opposed to the individual nature of the pursuit or 500m TT etc. Having won numerous national medals both in 2013 and 2012, Mulhearne was heavily marked in this road race style event. As the race panned out, lap after lap proved the same for the Carrick Wheelers man as the field followed him closely, refusing to allow him to break-away, monitoring his every move. Not happy to participate in the negative tactics of his fellow contestants Galway rider Aidan Reade of Black Rose CC broke away from the field in a successful bid for glory. Reade caught his competitors napping and got a big enough gap to allow him to solo all the way to the line to land the victory. Mulhearne did enjoy some success in this event leading the field home for the silver medal, a respectable award given the frustration he endured during the race. Brendan Whelan of Adamstown rounded out the medals taking bronze. With the 2013 cycling season coming to a close Mulhearne, in addition to his club mates, will take a well deserved break for the off season, before to winter training will begin for another year, 2014! To see the full set of results from the National Veteran’s Track Championships CLICK HERE.